"Rock Classics is a great source of inspiration to start your own slice of classic '70s/'80s rock." 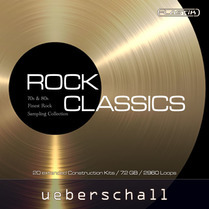 Rock Classics is a further release in Ueberschall's Elastik-based loop library series. In this case, we get 20 construction kits spread across a substantial (nearly 8GB) collection of samples. As someone who will happily admit to wearing out two copies of Thin Lizzy's Live & Dangerous album on vinyl before buying a CD copy, I'm quite partial to a bit of classic rock. It's worth emphasising that Ueberschall have a 1970s and 1980s target in mind here rather than material routed a little further back in time or, if you were born after 1995, anything that might now qualify as 'classic' in a grungy sort of a way. Given the size of the library, and the fairly standard 20 construction kits, you would be correct in assuming that each kit is fully stocked with sample options. Indeed, each construction kit can have as many as 14 different musical sections and, within each section, you get separate loops for each drum, guitar and bass part. For the drums, as well as a pre-mixed loop, you also get separate loops for the kick, snare top, snare bottom, hi-hat and overheads. Most of these sub-sections feature two or more different guitar parts. And while all these musical sub-sections require a little bit of work on the user's part to stitch them together into a complete backing track, they do give you an impressive amount of flexibility in building your musical arrangement into your own take on the song/chorus/bridge structure for any particular kit. Sonically, the recording and the tones used are pretty much spot on for the target style. The drums are punchy, but the production sound most certainly nods at the '70s/'80s, rather than something more modern. The guitar sounds are also of the period, although these are tones that lots of contemporary rock players often try to emulate, so a 'dated' label doesn't really apply. The playing is solid throughout but also quite restrained. There is little by way of histrionics — just good solid chord progressions and a shed-load of right-for-the-period riffs. What you are building here are complete backing tracks; you need to add your own rock vocal and the occasional solo to round things off. Auditioning the samples, it was easy to identify the musical inspirations behind this collection. If you think AC/DC, Van Halen, Def Leppard and Thin Lizzy then you will be in the right general area. This means that Rock Classics is perhaps a bit of a niche library. That said, current bands such as Airbourne or Black Stone Cherry do reference those styles quite heavily, so the library can be used by more than just media composers looking for a pastiche. Thankfully, unlike some albums from the original artists, Rock Classics avoids the temptation to cough up a ballad. For that, you are on your own; otherwise, Rock Classics is a great source of inspiration to start your own slice of classic '70s/'80s rock.